Originally published in 1989 Pictures at an Exhibition brings together a rich collection of essays, representing the diversity of views and approaches among professionals towards art and psychoanalysis and art therapy. 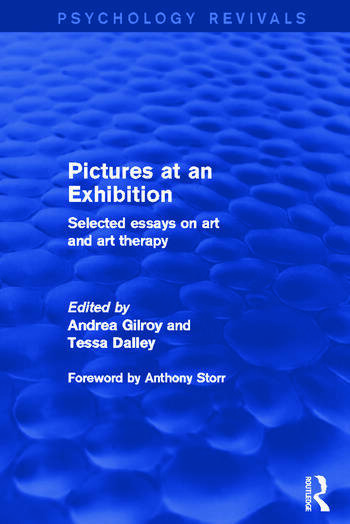 The editors, both of whom are practising art therapists and art therapy educators, have arranged the contributions so that they may be read in a way similar to looking at pictures in a gallery: they can be glanced at briefly or lingered over, read consecutively or dipped into at random. Artists, art therapists, psychotherapists, psychiatrists and art historians will all find something of interest, and something to stimulate thought and discussion. Contributions include innovative papers on the relationship between artists’ lives and the subject-matter of their work; the work of Kandinsky, Picasso, Magritte, Moore, Lear and Genet is looked at in particular. Generously illustrated, the book also highlights the importance of language and culture in attempting to understand imagery. Each contribution is linked by editorial comments drawing together the threads of concern which are common to art and psychiatry.